With today’s Nintendo Direct dropping a multitude of bomb shells. It was quite a shock when it came with the announcement of Shin Megami Tensei IV. We knew it was coming out, and very soon, and to many, that was good enough. To Atlus, that wasn’t enough! Not only did we get a concrete release date, but the PAL region got extremely good news in the form of an announcement that they too would be getting game this year. I always felt when it came to Atlus games, the PAL region got the short end of the stick at every turn, but it’s good on them to rectify that at a good time as this. Last, and certainly not least, the announcement that got the spotlight on both regional Nintendo Directs was the announcement of the “First Print Edition” of Shin Megami Tensei IV. Strategy & Design Book – Produced by Prima Games, longtime publishers of video game strategy content, and packed with walkthroughs, charts, maps, tips, and more, this official starter strategy guide will give the newly selected Samurai a distinct advantage as they begin their journey through the Eastern Kingdom of Mikado and beyond. The design side of the book will feature full-color pages of artwork ranging from concept art to in-game pieces to never-used designs from new Shin Megami Tensei series character designer, Masayuki Doi. Shin Megami Tensei Music Collection – Offering a collection of tracks specially selected from across the 20-plus-year history of the Shin Megami Tensei series, this CD presents the series’ musical history highlights from the ethereal atmospheric music to the classic power-guitar anthems. It also includes a special recording exclusive to the Music Collection CD. 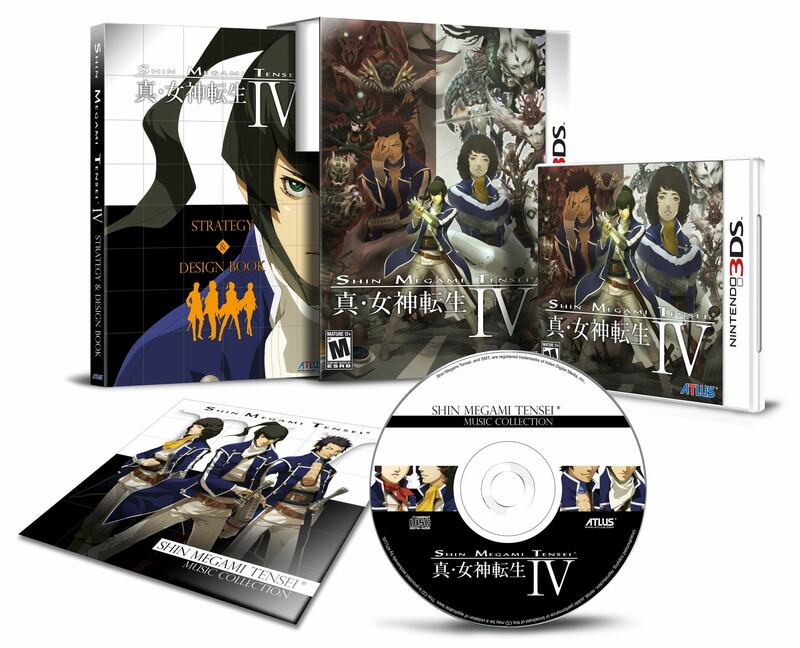 Collectible Slipcase Packaging – SMTIV will come in a deluxe-sized slipcase package featuring full-color key art designed by Masayuki Doi and depicting the divergent paths of law and chaos between which Samurai must travel and make their choices knowing of the potential foes and allies that lay on either side. As always, this is just for the first print run of the game. If you’re interested in this bonus, now is a good time to pre-order. This Nintendo 3DS exclusive will be heading to North America on July 16, of this year, with no solid release date for the PAL region. So stay tuned for that!